The silly season has begun in earnest, with rumours of driver changes and speculation popping up everywhere. But this year there's a new hint of passion in the mix; undercurrents of bad feeling have surfaced and become the driving force behind many of the moves suggested. Top of the bill remains the STR/Scott Speed saga. After news broke of his revealing interview with Adam Cooper of Racer magazine, observers immediately assumed that he was out of the team for good. 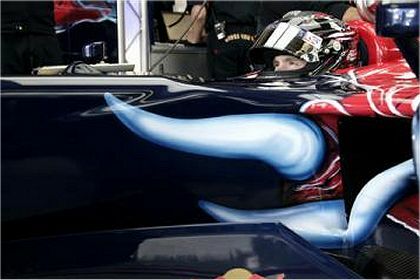 But Scott has appeared at Mugello and is currently testing the Toro Rosso as planned. Franz Tost, co-owner of the team with Gerhard Berger and the target of suggestions that he assaulted Speed during the European GP, is reported to have confirmed that Scott will be driving for them at the Hungarian GP. So what is going on? It seems that STR, after having decided to get rid of Speed, have had second thoughts and that Scott's father was quite right in his assertion that things were happening behind closed doors. It is most likely that STR found that the options they thought were available proved impossible and it became apparent that they needed Speed more than he needed them. Which means that BMW refused to allow Sebastian Vettel to transfer immediately to STR. Also influential in whatever decisions have been made is the intervention of Red Bull's Helmut Marko. In defending the STR drivers he made RBR's attitude to the spat quite obvious and Berger's petulant response was ill-considered at best. Reality has obviously made him reconsider. Whatever transpires, it is clear that there are strong feelings involved in this one. Assuming that Scott's account of events is accurate (and it is supported by eye witnesses), he may have added a few conditions to his return to the team; a stipulation that he be present for future announcements to the press would be one that I would insist on for a start. Over at Spyker, it has been announced that Sakon Yamamoto will take Christijan Albers' vacated seat. That comes as something of a surprise since he was not mentioned in all the speculation over possible drivers. But it may be that those suggested were not as willing to take the drive as everyone assumed; Nico Hulkenburg's manager, Willi Weber, has declared, somewhat scathingly, that he would not allow his charge to sit in a Spyker and Colin Kolles had an equally acid reply. Nelson Piquet Jr too has said that he turned down the offer of the Spyker drive. It all amounts to considerably more heat in the silly season than is usual, with personalities clashing and simmering tensions emerging from the background. And, when Flavio Briatore announces that he has deferred any decision on Renault's drivers for next year, naturally we assume that he is hoping that events at McLaren might make Fernando Alonso available for a seat in 2008. Add to that the reported clash between BMW's Heidfeld and Kubica, and we have a season of strong passions indeed. All this is very entertaining for F1-watchers but reflects badly on F1 in general. It is good that people should be so passionately involved in the sport but, when everything degenerates into mud-slinging, things have gone a little too far. Perhaps we all could learn a little from Alex Wurz's generous expression of congratulations to Mark Webber at the end of the European GP. I'm guessing that there's something of a shortage of drivers with both money, talent, and a willingness to walk into the mess that is Toro Rosso. I've never been as convinced by Speed as you, but itsa pretty clear either way that the team is really not the best place for any driver hoping to get on at the moment. Having said that, Speed is probably as well to stick it out there for the rest of the year - its not really clear where else he could go. If he can keep it with Mateschitz, maybe he can get a testing role at Red Bull next year. Not necessarily a step backwards. The Spyker situation rather suggests that good young drivers (or their management teams) are rather sceptical about the value of paying large sums of money for the pleasure of driving the slowest car on the grid, up against a driver (Sutil) who has looked pretty damned quick against both his team mates. Hence they've gone for Yamamoto- who is more or less competent. And rich. As for Alonso. I predicted some weeks ago that if he became champion, he might well simply retire. And I see that in this week's Autosport, Mark Hughes is suggesting the same thing. If not, a move back to Renault is likely only if both Alonso and Ron Dennis decides its in their interests. And in such circumstances, their interests would rather conflict. It's looking increasingly likely that your prediction regarding Alonso will prove correct, Patrick. When you consider how hard he has had to work this year and the criticism and doubts about his abilities, expressed in the media, I can see him taking the championship and making a quick exit indeed. And it wouldn't surprise me if Raikkonen did the same, as soon as he's grabbed that crown.